Occupy Berlin Continues Legally, For Now The Bundespressestrand, normally a beach bar in the summer, has been occupied by 50 activists of the Berlin Occupy movement since early November. According to protesters, they are allowed to stay until the middle of December but would like to extend their time. 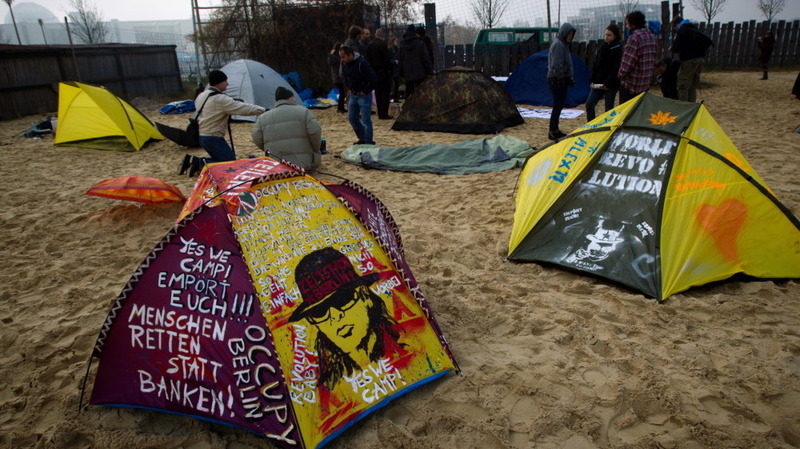 These tents, photographed November 11, were pitched at the Berlin Occupy Camp, located at the Bundespressestrand. A beach bar in the summer and close to the Regierungsviertel, some 50 activists are camped out here. A small group of people sit around an open fire at the Bundespressestrand in Berlin. The Bundespressestrand, normally a beach bar in the summer, has been occupied by 50 activists of the Berlin Occupy movement since November 9th. Pepper Chase, 23, from England, is one of the protesters camping out in the 30 tent site near the government district. "Here in Germany it seems very important for actions and demos to be legitimized for some reason. We are occupying this space, but we do have a permission from the landowner, which is a different situation to what's going on in London and, obviously, in America," Chase says. According to Chase, the protesters are allowed to stay until the middle of December but would like to extend their stay. "Wealth creates poverty" reads one sign at the Occupy Berlin camp. The day to day life on the campsite includes a lot of mundane chores, such as organizing food donations, cooking, and cleaning. Every day at 5:00 pm, they have an assembly at the site. It's open to everyone. Protester Suzy Nelson points out the visit of a prominent political activist. "We had Angela Davis from America come visit. It was wonderful to have her insight because she came from Oakland." "It made me feel like what is going on now is not a complete new thing but a continuation of something that has been going on for long time, and actually after all we can change some things," she says. When asked what the 23 year-old's personal reasons for supporting the Occupy movement were, they mention environmental concerns, world hunger, wars, and the distribution of wealth. "What has been a big epiphany for me has been realizing that my personal concerns are the concerns of the community," Chase says. "I think it's really important not to always put personal concerns before the concerns of everything else. I think that's the source of a lot of problems in our world, but it's an actual fact that what's best for society is best for us." Inside the media tent at the Berlin campsite, I meet David from Madrid. He jokes that his last name is Rockefeller. David has visited most Occupy camps in Germany and believes the movement in Spain seems much stronger because of Spain's economic and social situation. Germans are still very motivated, he says. "You can feel the support of the so-called common people. They actually agree, but they are still dealing with their lives." 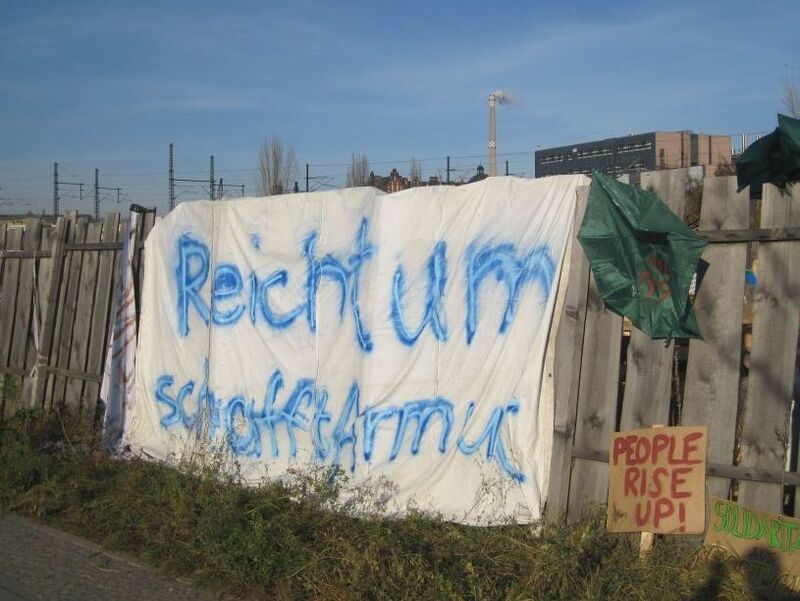 German Martin Ratf decided to dedicate the rest of the year to the Berlin Occupy movement. He documents their events and activities and puts them on YouTube. He says, first and foremost, he likes that people are coming together to have a real dialog and not just political slogans. He feels there is too much social injustice in this world and supports their desire for a more humane society.